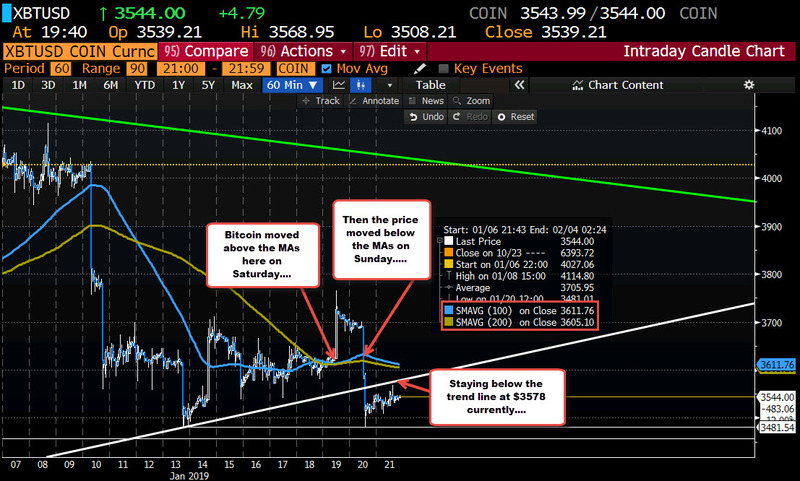 Over the weekend the price of bitcoin on Coinbase broke and rose above the 100 and 200 hour MAs (blue and green lines) on Saturday, and fell and broke back below the 100 and 200 hour MAs on Sunday. Those MA give a bias for the pair. Trade above them is more bullish. Move below is more bearish. The MA lines come in at $3611 (100 hour MA) and $3605 (200 hour MA) respectively. Today the range is a very modest $60 with a low at $3508 and a high at $3568. The price also fell below a lower trend line at $3578 currently. That too is a closer risk level for shorts (need to move above for a more bullish bias). January 13 at $3481.54, but momentum could not be sustained. The modest rebound sniffed the underside of the broken trend line at $3578, but has been able to stay below. SUMMARY: Bitcoin has been moving up and down over the last few weeks. Over that time, the 100 and 200 hour MA has seen breaks above and then breaks below. The fall on Sunday, tilted the bias back to the bearish side, but recent 2019 has been able to stall the fall. Bias is tilted a little more to downside, nevertheless, with a break of the $3481 level, a needed catalyst for more downside momentum.